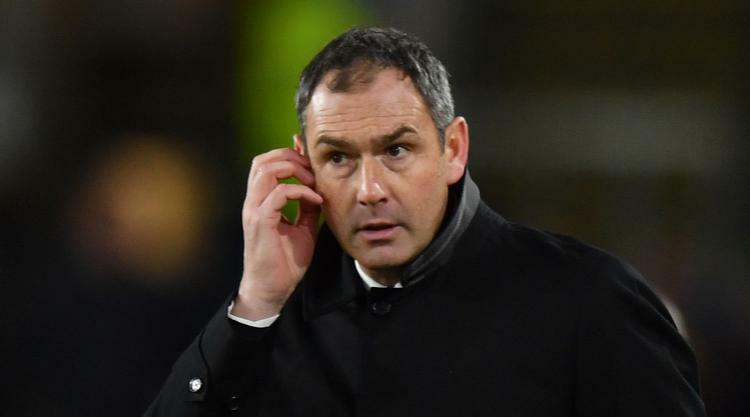 Swansea boss Paul Clement has called on his players to be "mentally tough" in coping with an increasingly fraught atmosphere at the Liberty Stadium. Four successive defeats have left Swansea one place and three points off the bottom of the Premier League ahead of Bournemouth's crunch visit on Saturday. Swansea have lost five of their six home games and supporters turned on the players during Brighton's win earlier this month with Tom Carroll and Sam Clucas jeered when substituted. "I think it has affected some players, that is normal - but they have to learn to deal with that ," C lement said. "You have to be mentally tough in times of difficulty when you are not playing so well and you make a mistake and the crowd turn a little bit. "How they deal with that is an important part of being mentally tough as a player. "The players have experienced it, they have to go out and try and perform well. "If something does goes wrong they must have the confidence and be positive enough to continue to try and do things correctly." Swansea's problems on the pitch have again been played out amid a backdrop of unrest off it. The Supporters' Trust, which owns 20 per cent of the club, is without a chairperson for the second time in little over a week after Will Morris stepped down citing alleged "unwarranted, unjustified and potentially libellous comments directed at him". Morris' departure from the Trust Board comes with fans still angry over the 2016 sale of the club, displeasure which was again voiced to Swansea's American owners and chairman Huw Jenkins during the Brighton defeat. "I know there are some issues going on but that is not affecting the team or me," Clement said. "I work very closely with the team every day on the training field and in the meeting room and we're only focused on performances. We never discuss other issues. "I know in recent games the crowd has been a bit edgy, but I hope they get behind the team and support them because the players can feed off that good energy." Another source of supporters' discontent has been the failure of high-profile summer signing Roque Mesa to force his way into a struggling side. The Spanish midfielder - widely regarded as one of LaLiga's best technicians last season - arrived from Las Palmas in a Â£11million deal but has started only once in the Premier League. "His adaptation period is over. We are into November now and he, and others, will be picked on merit," Clement said. "When I see signs of consistency and readiness, a player will get his chance. "I'm making changes and I don't want to be doing that. "I want to see consistency from the players and from the team. When I see that the team will settle."